Hello my lovely blog reader, thank goodness is the weekend. I am particularly excited as I am in London enjoying a relaxing weekend with my sister and her family. Of course this means spending lots of time with my delicious little nephew Luca, I cannot wait and I am sure that by the end of this weekend I will have some cute pictures to share with you. 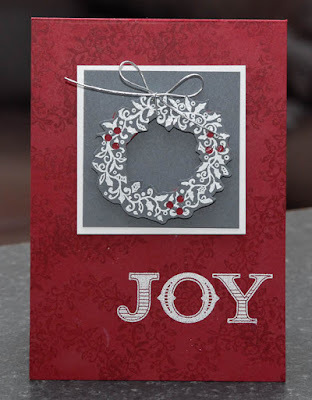 I am still in Christmas mode and I have tons of cards left to make, so here's a lovely Christmas card using my favourite Christmas set from the new catalogue, WELCOME CHRISTMAS. I am also in love with the combination as well, very shabby chic, it reminds me of a authentic Scandinavian interior. 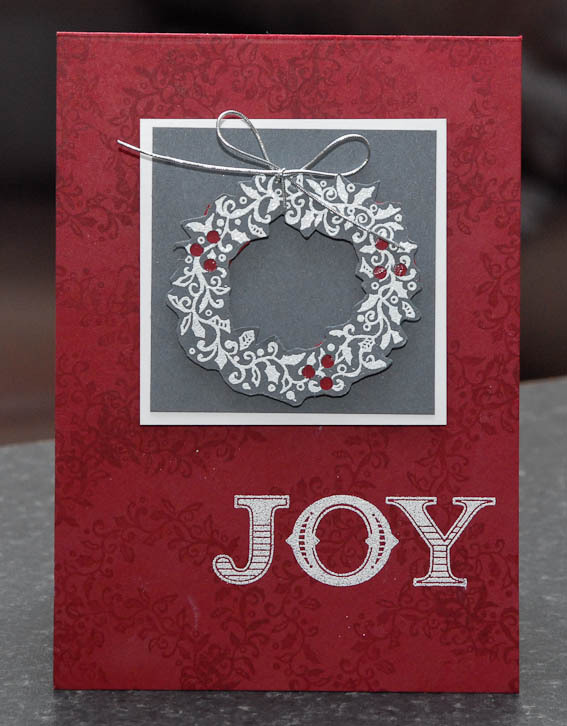 Cherry Cobbler and Basic Gray grounded with crisp whisper white. 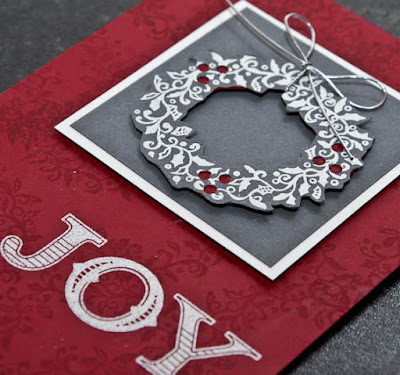 I have embossed both images in white powder and I love the neat trick using the hole punch to add the cute berries. The wreath also makes a wonderful background. This set is party of the promotion for November and December, order the set and the gorgeous Christmas Cocoa designer papers and claim a free reel of ribbon absoluetly FREE> here s the ribbon choice and the lovely papers. 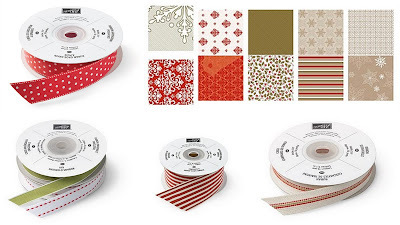 I have a few examples to share with you next week using those gorgeous papers. I do love those papers some of the designs are flocked totally gorgeous and delicious. But the ribbon is even more pretty. 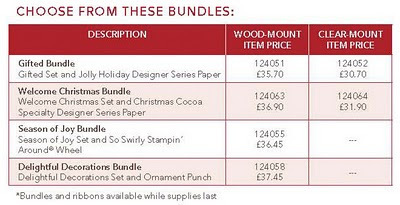 The table is here should you want to see the ordering codes. Back to my card featured here is the quick video for it and a different close view. You have a lovely blog with great photos. I am a new follower and passionate crafter too. Hi Monica ... what a lovely lovely new blog you have ... of course it goes without saying it's what I've come to expect of you - only the best!!! Hi Monica ... what a lovely lovely new blog you have - simply the best!